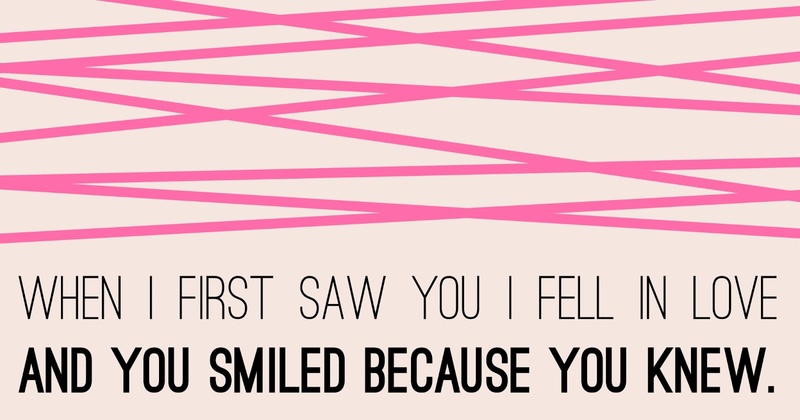 "When I first saw you I fell in love and you smiled because you knew." I just had to get into the Valentine's spirit. Do you believe in love at first sight? I don't believe in love at first sight- I think you can definitely have "lust" at first sight if you find someone attractive. However, I DO think you can fall in love at the first meeting of someone- after talking to them, seeing them interact, learning more about them, etc. But not just solely by a 10-second glance. It's a very cute quote, though! what a cute quote! and yes we do! Such a sweet quote! I'm not sure about love at first sight, but I definitely believe you just "know" when you meet someone that they're going to be special to you. I've definitely experienced that a few times before! 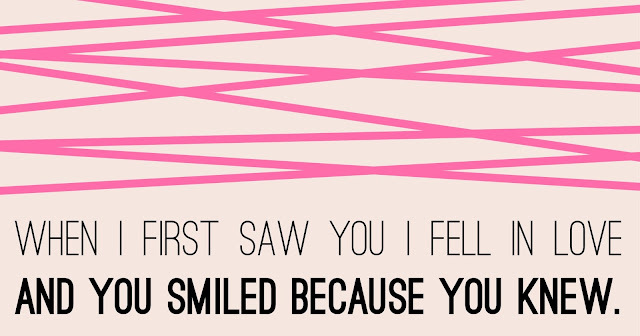 Lovely quote, feeling so valentines day-ey! I do! Or at least an intense connection. With few people who I have become close to in my life romantically, including my husband, there was definitely some instantaneous there that started everything. I don't know that it is always love at very first sight, but there certainly are those moments when you look at somebody completely differently for the first time - and you just know, something has changed and you wouldn't want it any other way. You are smitten. I really want to believe in it, but who knows;) btw love the sweater from your last post! I don't really believe in love at first sight. I believe in a connection at first sight that is mistaken for love. But I do believe that when that connection is felt and built upon, it will grow into love. It's just a little feeling that can grow into something grand and epic. I wanted to toss in my opinion - I don't believe in love at first site, but at first interaction. I knew my boyfriend and I were going to be together almost right away.